It's fair to say that the original Voicelive changed the way many musicians played, offering incredible features for enhancing your guitar o.. It's fair to say that the original Voicelive changed the way many musicians played, offering incredible features for enhancing your guitar or vocal sound, building huge looped arrangements and improvising in totally new ways. TC have only gone from strength to strength and the Voicelive 3 Extreme represents the next big leap in vocal processing, with even more power at your feet and an expanded feature set without compromising its ease of use. When TC-Helicon introduced VoiceLive 3 at NAMM 2014, it heralded a revolution in processing for singers with the first combination of truly professional vocal and guitar FX in one box. With VoiceLive 3 Extreme, the bar is now set even higher! Much more than a simple upgrade, VoiceLive 3 Extreme has 4 times the built-in memory for loops and adds backing-track storage. 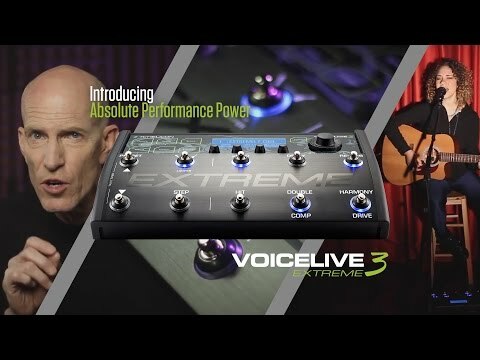 With groundbreaking FX automation features, all synchronized to the audio, VoiceLive 3 Extreme really can allow creative solo performers and singers to connect with their audiences like never before. Add to that 24-bit stereo recording via a connected USB flash drive, along with import/export of loops and backing tracks via USB and VoiceLive 3 Extreme becomes THE one essential product for any solo performer or singers who want to take their performances to an even higher level. Connect with your audience like never before. Groundbreaking FX automation and backing track playback sets you free to focus solely on your performance, while awe-inspiring vocal effects and rich guitar sounds run effortlessly by themselves. From the first song idea to the execution of complex live arrangements, everything you’ve worked for comes together in VoiceLive 3 Extreme. If VoiceLive products are the stepping-stone to studio perfection in live performance, VoiceLive 3 Extreme is the one completing the journey. It all starts in rehearsal with you loading up a backing track. Whether it’s just drums, bass, or a full band mix-down, VoiceLive 3 Extreme lets you capture all your FX changes synced to your track; harmonies, delays, guitar FX, anything you can think of. You can even record speedy FX changes that would otherwise be physically impossible using the switches alone. It ends with you on stage. Simply pressing play on VoiceLive 3 Extreme and an amazing thing happens – your track plays back with all the FX changes you perfected at home, completely automated for your performance. You’re free to connect with your audience and everyone around you. All that hard work you did before the gig – making your song sound just right – is heard every time you perform. The inspiration that follows from carefully planning out your songs with backing tracks and FX sequencing is beautifully matched by the onboard audio recorder that allows you to capture everything you do in glorious 24-bit quality. Record every live performance, every home practice all with professional studio fidelity and effects – both vocal and guitar. Turn your tour into EP material or your late night jams into SoundCloud gold. It’s all possible with just your talent, VoiceLive 3 Extreme and a USB flash drive. With a mind-blowing vocal FX path featuring 11 independent effects blocks, over 180 different pre-programmed styles and more than 250 factory presets available right out of the box (and more available for free download), VoiceLive 3 Extreme represents the absolute pinnacle of singers technology and is the perfect partner for your voice.